By now you probably have learned about the entry of Google Classroom across the country. At the very same time you might be finally getting use to the LMS (Learning Management System) your school district has adopted. Before you you throw out the old and/or run from the new… you might just want to take a breathe, sit down, and consider how both might have a place in your 21st century classroom. As in all technology integration, it really comes down to purpose of the tool you are using. Chances are your LMS (Learning Management System) has a wonderful place by now in your classroom. Is there a reason for something new? This provides an opportunity to weigh in on both your LMS strengths and weakness. Is there something you wish it could do? Are there are things it can do, but do not seem streamlined? Are you already using Google Apps and Drive but wish things could flow just a little better? Next… you may wish to read about and become more familiar with Google Classroom. 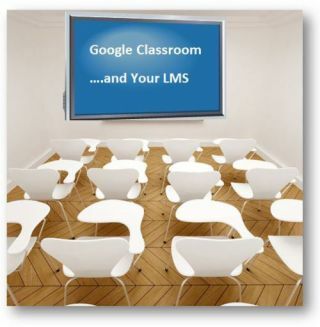 What might be one thing it allows you to do that your LMS does not? Perhaps there is something that will make productivity easier. This might be the perfect opportunity for you, or a team of teachers, to put the information regarding your LMS and Google Classroom on a Venn Diagram. After careful and collaborative study you and your peers might find one item you might wish to adopt from Google Classroom. In fact, that one item might just save you time and allow you and your students to be more productive. If there are other items, put those on the back table… focus on the one. Next, consider what you might need to do to make that one item possible. Does it involve a new link in your LMS? Do you need to build, or better yet… have your IT Department build, a class set up in Google? Also, note that you can have students opt into a class using a code. You might also want to give a new set of directions to your students. Could this be posted on a LMS and authored collaboratively? If you find that one thing, you can now make a plan and involve others if possible. Give it a test run and be ready to evaluate. In your evaluation, consider if it worked as you wished, increased productivity, and provided a valuable resource. Next consider if it should it be continued, and what refinements are needed? There really is a wonderful chance that you will find new success. Be sure to celebrate your success and take some time away before trying one more step. As technology progresses there will always be a new possibility. Our job as educators is to decide how it works with what we already have. We must also consider if it provides our students the best learning experience possible. If we can do this collectively we will be able to do so much more. Last, take a moment to enjoy the fruits of your labor and relax before trying the next possible application that Google Classroom might allow for. In the space below I have provided some steps you may wish to think about while deciding if a new tool such as Google Classroom should be piloted. Of course, you may already be a Google Docs District… which may help with one or two steps. Remember that Google Classroom may actually not replace that LMS you are feeling so comfortable with… but it just might enhance it.